Buying Hot Tub Cover: 3 Important Things + How to Measure The Cover? If you had performed due diligence before purchasing your hot tub, then, you must have discovered that some hot tubs came with covers, while some had no covers. If for some reasons, you bought the tub without a cover, then, have no fear. What if I tell you that you can still purchase the right cover for your hot tub without burning your pockets in doing so, will you believe me? Well, that’s what I will be covering in this article. What are the advantages of using the right hot tub covers? This point won’t be related to inflatable hot tubs, but it’s nice to point it out. Sitting on a top of the tub. There are times when you just want to be near the tub and not inside of it. A tub cover provides the right platform for this. If the cover is strong enough as it should be, then you can sit on it for a few minutes. Tub covers add some gloss to the tub itself. So if you like the elegance that tub covers add to hot tubs, then, by all means, go for it. Complete covers. Ensure that the cover you tend to buy is exactly or slightly larger than the tub itself. This is to ensure that the purpose of buying the cover (protection, safety, and reduction of a heating bill) is not defeated. If you are concerned as to how to obtain the right dimensions for your tub, don’t be. Most manufacturers and marketers provide videos and or other forms of tutorial on how you can effectively measure the dimensions of your tub so that you can buy the right tub cover for it. Of course, after purchase and installation, your cover is bound to suffer from rumpling and waterlogging (sometimes molding) with use. With water logging and or molding, comes increased debris which can also lead to less longevity for your tub. With rumple comes an increase in the amount of heat loss from the tub without use and which means an increase in your heating bill. To reduce the effect of any these, detach the cover from the tub every 2 to 3 months to drain out any water that might be trapped in there. If despite these preventive measures, you are still experiencing water logging and or rumpling, then, it is advisable that you look into buying a new tub cover. My advice is that you do not go for the cheapest when trying to buy your tub cover. If you do, then, your tub will not last as it ought to. Then, you can rest assured of buying the right tub cover with confidence. Did you know that most inflatable hot tubs have basic cover included? How to measure the cover? 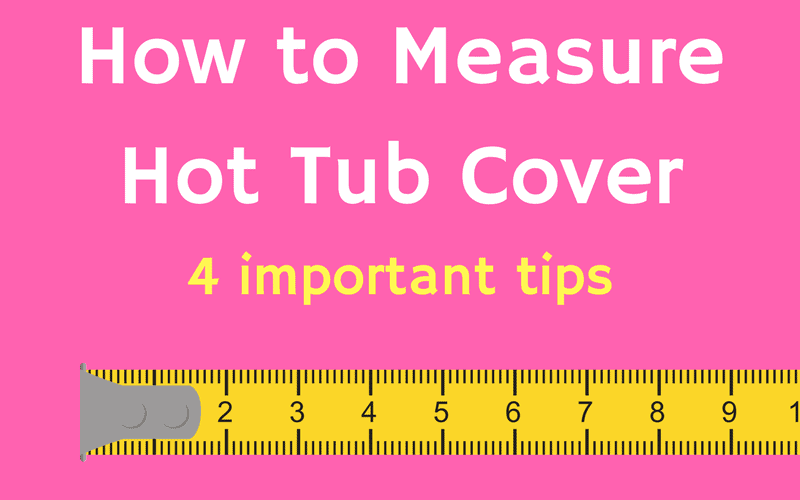 One of the biggest reasons why you can fail when trying to measure the cover of your tub is not taking a little bit of time to learn how to properly measure the cover for your tub. Of course, you know that if you fail at taking the right measurement for your cover, you end up buying the wrong cover which means your precious tub is no longer safe from debris, accidental falls or increase in your electricity bill. I have never taken a measurement in my life; won’t I fumble at this and make a joke of myself? the tub or tub cover which of these should I measure? All these are valid fears. Let me answer the above questions one after the other. We have all made mistakes myself included. It is just like telling yourself that because you fell down from riding a bicycle for the first time, you will not try again. So the answer to your question is to give it a go, follow the right guide and you will be able to conquer your fear of taking measurements. The tub or tub cover, which of these should I measure? The right answer is the tub cover. However, if the cover is so old that some parts of it have worn off, then, it is better to take the dimensions of the tub itself. An acrylic is any product made from the chemical compound – acrylic acid. If you still have more questions, a simple google search will help you a long way. Just ensure that you allocate a specific period of time for your search so that you won’t get caught up just goofing around the internet for a whole day with no task accomplished. This is repeated for emphasis sake, measure the tub cover and the tub dimensions if the tub cover is still very intact. If it is not intact, measure the tub dimensions – the length and breadth are crucial. Tip 2: Always Add An Extra 0.5 Inches To Your Measurement. This is to rectify any mistakes made during the measurement. This mistake may cause your new tub cover not to fit appropriately. A half inch of over measurement will still make your cover fit very well. Tip 3: A Custom Cover Can Be Made Available. There are different companies that specialize in creating tub covers as well as tub cover accessories – control panels, handles, air buttons, headrests, control panels, handles, etc. For example, hot tub covers Canada. If there is anything bothering you that you need clarification on, use this email address. No matter how durable your cover is, the sun often weakens the material so make sure to check the cover for any defects and change it for a new one accordingly.